Always love quick bread for breakfast or in between snack. This week tried my hand baking this Fantastic Apricot Bread. This bread can be baked with yeast but am not in the mood to knead or spend time waiting for it to rise. 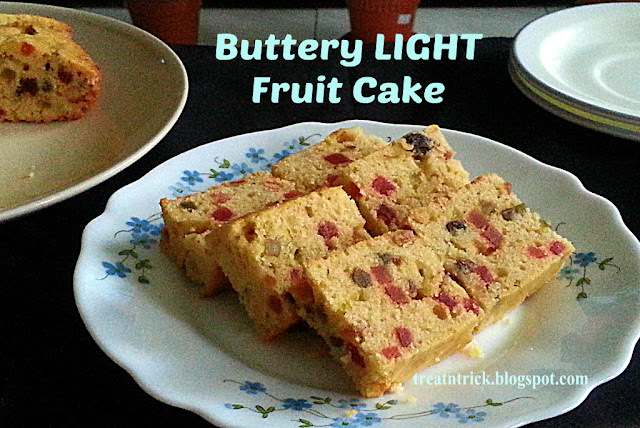 So chosen this fruit laden quick bread. Before you start, chopped dry apricot into small pieces but fairly visible. Soak them in water for good 30 minutes. Squeeze out the water. keep aside. 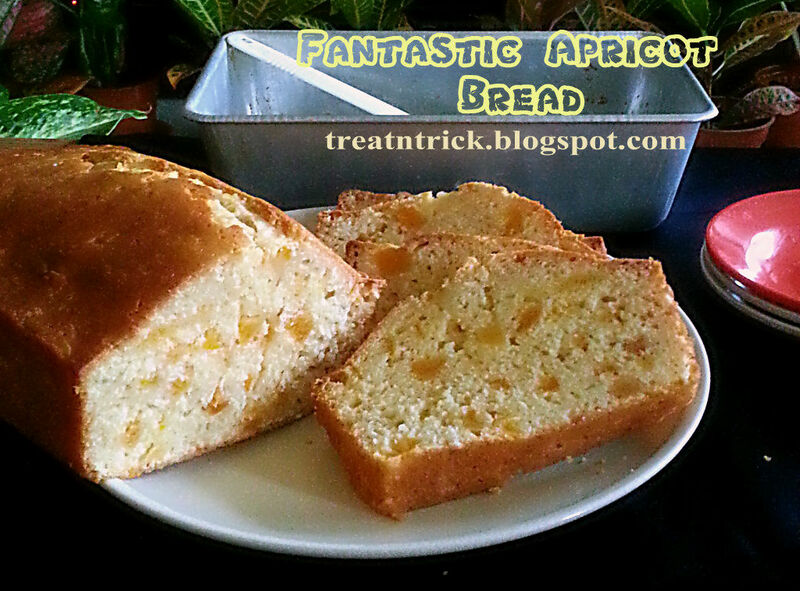 This Fantastic Apricot Bread was really sweet so it doesn't need any glaze at all. Have seen a few recipes with less sugar but uses glaze after it has been baked. Which one do you prefer, less sugar with glaze or without? This bread received high marks from my family, we are expecting some guest for couple of days, have planned to bake it again. Chopped apricot into small chunk, soak in water for 30 minutes . Squeeze out to dry. Grease lightly a loaf pan. Preheat oven @ 160 C.
Whisk together 1st 4 ingredients in a mixing bowl. In another bowl, whisk together butter, sugar and egg. Add in orange juice and milk. Now combine dry ingredients and milk mixture, stir to combine. Mix in apricot, stir until well incorporated. Spoon into prepared pan, bake for 60-70 minutes or until a skewer inserted comes out clean. Cool in pan for 20 minutes before transferring onto rack to cool. that really does look like a fantastic loaf... wonderful with a cuppa! So sweet I don't need glaze, that's my kind of bread! It looks scrumptious and I can hardly wait to try it. I love apricots! This is right up my alley! It looks amazing! Thanks for sharing at #SmallVictories linkup! Oh, this sounds heavenly! I didn't know I liked apricot until I had baked brie and now I can't get enough! Another Yummy post on your blog!! I wonder how you find time to try out so many awesome recipes with your readers and share with us.. Keep up the good work!!! 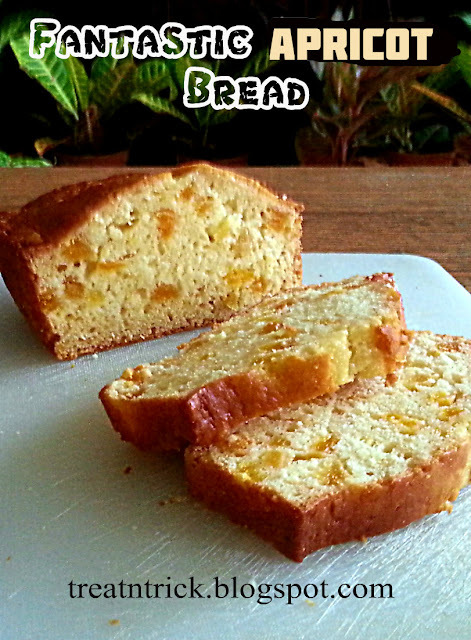 Lovely recipe and delicious looking bread! This sounds good. I don't have dried apricots but, just picked up fresh. Wonder if I can adapt it slightly. Pinning to try. Thanks for sharing your recipe. Sounds delicious! Thanks for linking up with Merry Monday this week. This is packed with summer flavors! Oh my goodness, I'm just waking up and I am drooling over your bread! I would give anything for a slice with a cup of coffee right about now! Pinned! I've never heard of this before, but it sounds wonderful. do you think it would work with fresh apricots too, or would they have too much moisture? Anyway, thank you for sharing this recipe over at The Really Crafty Link Party this week. Pinned! This looks delicious. It is also an unique recipe idea and I like that a lot. The Recipe Share Pinterest and Yummly Party starts every Thursday 9:00 am EST and runs through Friday Midnight EST. There are no requirements to participate in this linky party. Just link up your posts and Pin and Yum the other bloggers’ recipes! Try to leave a comment with the party name to let them know you were there and how you found them. We all love a bit of feedback. I would love it if you subscribed to my party notice email list. You don't want to miss a chance to reach a larger audience! This is an awesome bread! 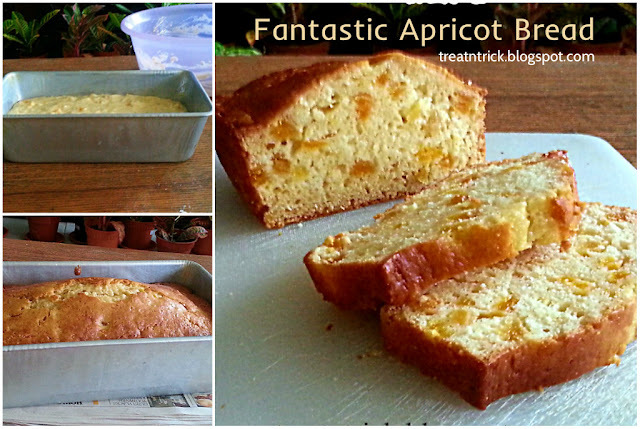 This would be right up my alley, b/c I love apricots, and it looks so good. Thanks for sharing at Sweet Inspiration! This is lovely! I know I will love it with a cup of tea! I don't like sugary desserts, so this is perfect for me. That looks delicious! While I do enjoy a sweet bread with glaze.. I rarely take the time to bother making one. I like quick and easy recipes and since the sweet breads can last for a few days in our house those without a glaze store and reheat better. Pinned. Looks like a delicious treat! Thanks for sharing at the What's for Dinner party. Hope your week ahead is amazing! Apricots have such a neat flavor, and I bet this bread is amazing. I can't wait to try this myself!